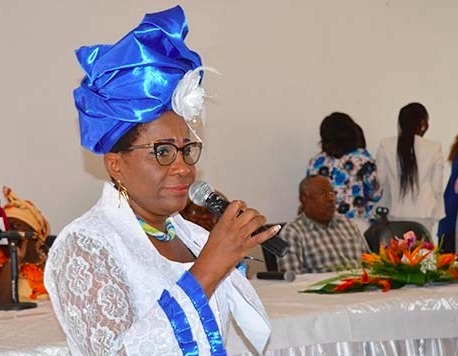 Victoire Lasseni-Duboze was elected head of the Panafrican Women’s Network for Culture of Peace and Sustainable Development-Gabon section, at their Constitutive General Assembly which took place last weekend at the Libreville Chamber of Commerce. The Assembly was supported by the United Nations System in Gabon and the Doupambi-Matoka Foundation for Solidarity Development. Victoire Lasseni- Duboze during her speech / DR. This the culmination of a long process launched in 2017 with the implementation of the project “Support to the contribution of women to the promotion of the culture of peace and the objectives of sustainable development in Gabon” , initiated by the mediator of the Republic. It consisted of the realization of several women’s activities including the celebrations of International Women’s Day (8 March) and Peace (21 September). The purpose of the activities is to promote the conditions for harmonious and peaceful living together for women from civil society and the artistic, cultural and scientific worlds. More than 200 women committed to creating a national network for a culture of peace and sustainable development during the first celebration. In 2017, during the international day of peace, the network was formalized by the establishment of a temporary office, which has started to elaborate the draft statutes, rules of procedure and action plan. At the meeting, Stephen Jackson, coordinator of the United Nations System in Gabon, said: “I therefore welcome the convening of this constituent General Assembly of the Pan-African Women’s Network for the Culture of Peace and Development. sustainable-section Gabon. It testifies not only to the strength of conviction and commitment of Gabonese women but also it highlights, in line with the National Decade of Women (2015-2025 ), the awareness and recognition in this country of the necessary contribution of women to national development “. After her election Victoire Lasseni-Duboze announced that the network will be set up in the nine provinces of Gabon. Because, she added: “we need peace throughout the territory”. The Panafrican Network of Women for Culture of Peace and Sustainable Development will aim to mobilize the women of Gabonese and African civil society in accordance with the “Plan of Action for a Culture of Peace in Africa- Take Action for Peace, adopted in Luanda, Angola, in March 2013, following the Pan-African Forum “Sources and Resources for a Culture of Peace”.